Where in the world are EEGS members and what are they working on? Each month, EEGS member projects are featured. Submit projects to "Photos from the Field" at [email protected]. NASA’s Operation IceBridge is a multi-year project that is monitoring changes in Arctic and Antarctic polar ice, including ice sheets, sea ice, and glaciers, to provide a high-resolution suite of data to aid in the prediction of its response to climate change. The data from this project is providing continuity in polar observations between NASA’s Ice, Cloud and Land Elevation Satellite (ICESat), in orbit since 2003 and decommissioned in 2009, and ICESat-2, plannedfor launch in early 2016. Several research aircraft with multiple instruments that measure ice elevation and thickness, snow depth, surface temperature, bedrock topography, and underlying geology are involved, and all raw and processed datasets are available for download through the National Snow and Ice Data Center (NSIDC). 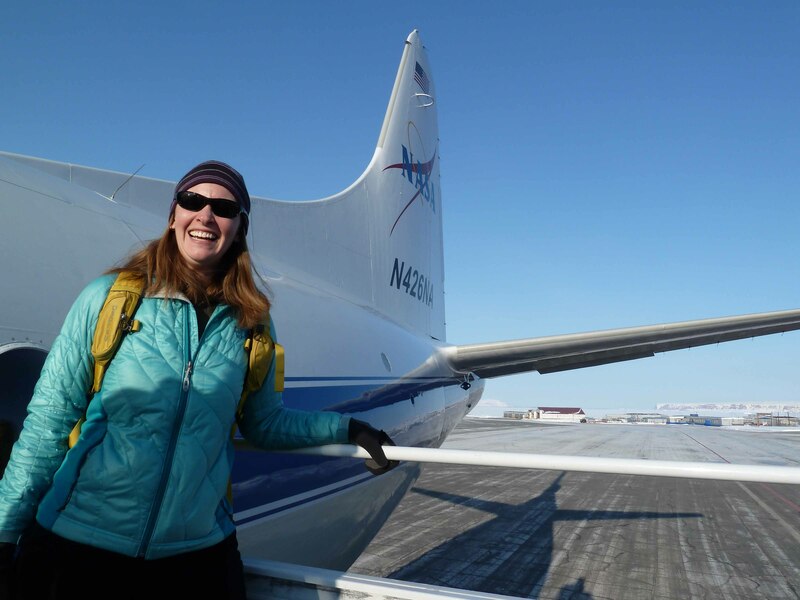 I’ve been involved with the magnetometer onboard the P-3B aircraft during the spring 2011 and 2012 Greenland campaigns as well as the upcoming Antarctic cacampaign this fall. Greenland operations are based out of Thule Air Force Base in northwest Greenland and Kangerlussuaq, along the central west coast. The P-3B aircraft includes several different radar systems, laser altimeters, a surface temperature instrument, an aerial photography system, a gravimeter, and a magnetometer. The main purpose of the magnetic data is to supplement the radar and gravity data in mapping the bedrock topography in areas where massive crevassing scatters the radar signal and in mapping bathymetry below glacier tongues where the signal losses are high due to the conductive sea water. On each eight-hour survey flight, as an onboard instrument operator, I monitor the data acquisition, process data, discuss observations with other operators, and enjoy the scenery. With a survey altitude of 1,500 ft above ground level, the views along glacier runs and along the coastlines are incredible. This project has been a great opportunity to work with other scientists and engineers from different disciplines and to learn more about polar science, a much different application for me as compared to my typical near surface projects. 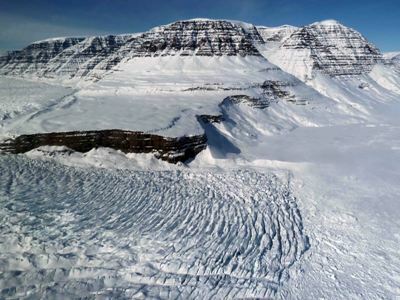 Top discoveries involving IceBridge data include a massive canyon larger than the Grand Canyon located below the Petermann Glacier in northern Greenland and the initial rift along the Pine Island Glacier in Antarctica in 2011 that eventually led to a 280-square mile iceberg in 2013. The upcoming Antarctic campaign will be the first time the P-3B will be based out of McMurdo Station, instead of Chile, so will provide new logistical challenges for the instrument teams and aircrew, but I’m looking forward to the experience. Calving front of a glacier in the Geikie Plateau region in eastern Greenland. 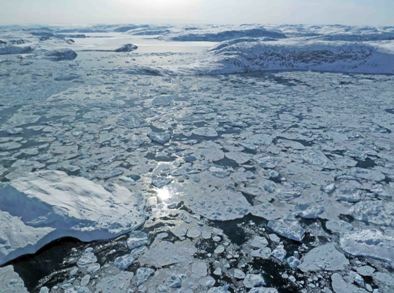 Calving front of a glacier on the right side with melting sea ice "lily pads" and freshwater icebergs intermixed in Disko Bay, western Greenland. 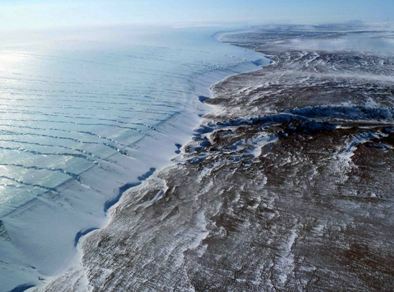 Edge of the Greenland Ice Sheet along Cape Alexander, northwestern Greenland, with numerous incised drainages. 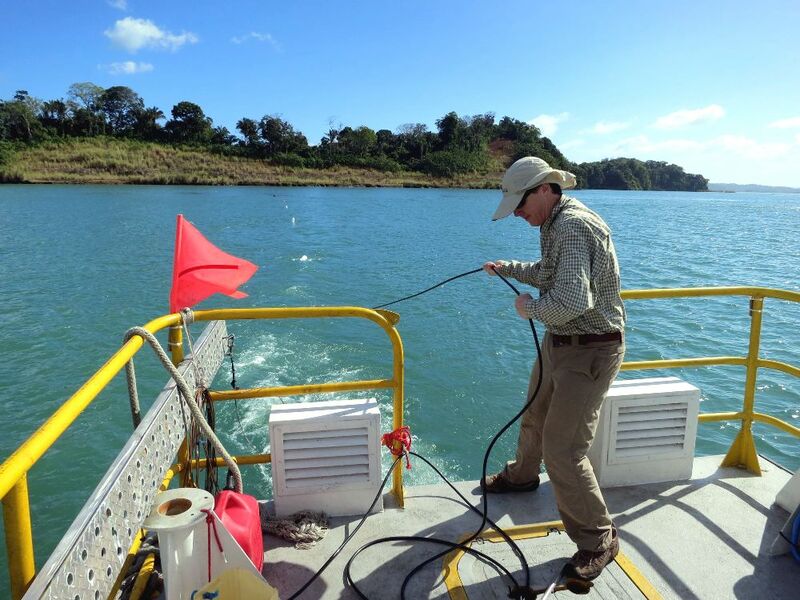 Deploying Cable – Marine seismic refraction being carried out in Lake Gatun, Panama for the Third Set of Locks Project. 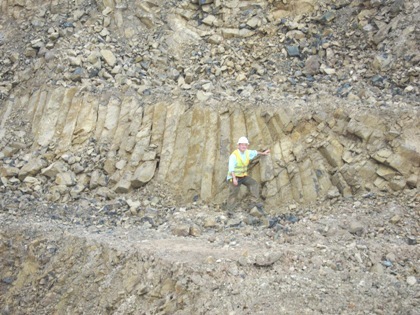 Columnar basalt exposed in an excavation for the Panama Canal Third Set of Locks Project. 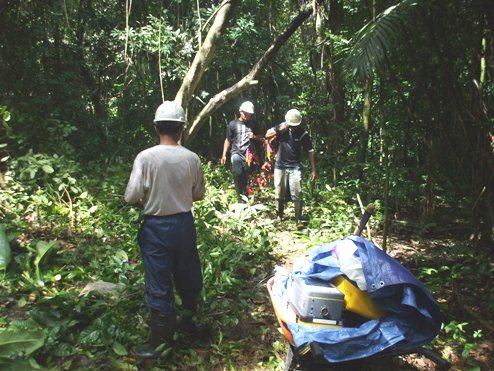 Seismic crew working in the Panama jungle for a bridge alignment investigation.